That's a conversion of Zebra; an ancient car made by the game creators. Its picture can be found on RV Gallery, as many of Paul Phippen concept arts. 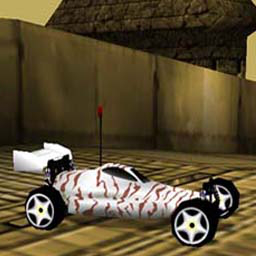 In some point of Re-Volt development time, for some reason, they abandoned the idea of a car with stripes. And then, Zebra became Evil Weasel. *Reconverted the car from the .lwo file.